Jamee Peyton joined the GreenPrisons.org team as Operations Manager in January 2016. She has three years of experience working in private security through the Federal Medical Center (FMC) in Lexington, Kentucky; along with independent practice during an internship in case management through FMC in a correctional setting. Jamee has initiated and implemented not-for-profit fundraising work, managed business administration, and promotional advertising for the past five years. Through additional volunteer efforts as a Court Appointed Special advocate, she has become well-versed in programming and resources available for victims as well as offenders of domestic crimes. Jamee has a passion for the rehabilitation efforts associated with both juvenile and adult offenders, along with an appreciation for the thriving efforts to value and modestly expend environmental resources. Reducing unnecessary environmental impacts while enhancing the functionality of correctional institutions has brought Jamee to GreenPrisons.org with emphasis on green technologies, sustainable practice, and enhancement of inmate skill and post-incarceration opportunities. 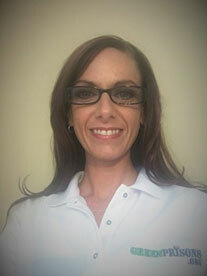 Jamee is a Bachelors level Eastern Kentucky University graduate of the Criminal Justice program (2010), and currently completing her Masters in Forensic Clinical Counseling.